When Las Vegas Sands threw a party last year to celebrate a milestone in the construction of its gambling resort on the shores of Singapore's Marina Bay, it was a lavish affair. A large white tent was erected on the site, where hundreds of reporters gathered to watch CEO Sheldon Adelson celebrate the roof being laid on the resort's three interlinked towers. As bongo drums pounded, Adelson, 76, turned to the architect of the project to thank him, but not before joking, "Couldn't you have designed it to look as good without the cost?" Just how much money has been poured in  and how daunting the challenge of recouping that money will be  are becoming clear as the first of Singapore's long-awaited casinos prepares to throw open its doors this month. Citigroup estimates that Resorts World Sentosa, slated to open in mid-February and which will include six hotels and a Universal Studios theme park, will have run a construction tab of roughly $4.5 billion. Adelson says his showpiece project on Marina Bay, boasting Singapore's largest hotel and one of Asia's biggest convention spaces, will cost roughly $5.5 billion by the time it's expected to open around April. Even by the opulent standards of the gaming world, analysts say these are giant sums. "The Singapore casinos are by far the most expensive ones in the region," says Gabriel Chan, head of Asian gaming research for Credit Suisse, who points out that an average casino in Macau costs roughly half as much. The Venetian in Las Vegas, completed by Adelson more than a decade ago, cost roughly $1.5 billion  less than a third of his current Singapore project. Keen to repeat the success of Macau, which over the last decade has transformed itself from a sleepy gambling backwater into an entertainment destination, the Singapore government awarded the bids to build the two casino resorts to Las Vegas Sands and Genting in 2006. The hefty $10-billion price tag for the two developments underscore the vast ambitions of Singapore's leaders seeking to similarly transform the island's image from that of a staid, buttoned-up society into a fun, adventurous city. And while that may be fine for foreign tourists, analysts say the high fee to be imposed on Singaporeans who visit the casinos reflects the city-state's underlying unease at the thought of its conservative citizens turning into hard-partying gamblers  and making it difficult for operators to start profiting off their massive investments. For Genting, operator of Resorts World Sentosa, recouping its $4.5 billion investment won't be easy. Even though it will be one of two exclusive casino operators, unlike Macau or Las Vegas, where there is fierce competition within a much larger pool, analysts and investors have set their initial expectations for Sentosa's gaming revenues "far too high," says Citigroup analyst Dominic Noel-Johnson. To meet Citigroup's relatively conservative 2011 gaming revenue estimate of $1.2 billion for Resorts World Sentosa  more than a third less than the consensus of other brokerage houses  every single foreign tourist expected to come to the island that year would have to visit either one of Singapore's two integrated resorts. In addition to that unlikely scenario, every adult 21 and over in Singaporean would have to go to one of the casinos five times a year, and every adult resident of neighboring Malaysian state Johor would have to go twice every year. Is all that likely? No, Noel-Johnson says, even though such robust expectations are clearly reflected in the high price of Genting Singapore's stock, currently the most expensive gaming stock in the world. According to Noel-Johnson, Genting Singapore is trading at an estimated price-to-earnings ratio of over 60 for the current fiscal year. Even though he believes Resorts World Sentosa has the potential to be "a long-term success," Citigroup has slapped a "sell" rating on the stock. The unusually high $70 daily casino entrance fee, or $1400 for an annual pass, being imposed on local visitors will be one of the casinos biggest obstacles. "The entry levy is meant to signal that gambling is an expense, not a means to make a living," explains Lim Hock San, Chairman of the National Council on Problem Gambling. "It discourages impulse gambling." Though betting on horse races is allowed in Singapore, the government strictly controls other forms of gambling, one of the reasons it plans to allow only two casinos to operate on the small island. The families of gambling addicts can also apply for their loved ones to be excluded from the upcoming casinos, according to the National Council on Problem Gambling. The council, which will provide the casinos a list of those who are barred, has already excluded 29,000 people. Drawing on past government surveys, it estimates the size of probable "pathological" gamblers at about 1.1% to 2.2% of Singapore's adult population, similar to those found in Macau and Hong Kong. Such fees may help discourage gambling addicts from throwing their salaries away. But they are also likely to be a hurdle in building up the number of local gamblers and will likely force casino operators to depend more on foreign "high-rollers" to turn a profit. That strategy has its risks, analysts say. Noel-Johnson, for instance, points out that 72% of visitors to Genting's resort in the Malaysian highlands are local "day-trippers," and more than half the visitors to Macau's casinos are gamblers from Hong Kong and Guangdong province who bet with limited cash. "If you look at the successful gaming markets in Asia, they have a dependable local mass market," he says. "If you are inhibiting Singaporeans from visiting the casinos, you are handicapping yourself." Resorts World Sentosa executives, for their part, say they were aware of the local entrance fees before they bid for the casino. They counter that they have a diverse range of entertainment offerings, including the Universal Studios theme park as well as fine dining and hotels, and so are not solely reliant on gaming. (Local families who elect to only visit Universal Studios and not gamble, for instance, would not have to pay the casino entrance fee.) "Resorts World is on track to reach its target of 13 million visitors in its first year of operations," says Robin Goh, Assistant Director of Communications at Resorts World Sentosa. Executives from Adelson's Marina Bay Sands resort echo the sentiment. "While the casino is an important component of our integrated resort, our convention center, entertainment, celebrity chef restaurants and luxury shopping mall will bring tens of thousands of people daily," says Thomas Arasi, CEO of Marina Bay Sands. "Las Vegas Sands has opened and run integrated resorts in Las Vegas and Macau, and we think this is a successful business model that will also work in Singapore." 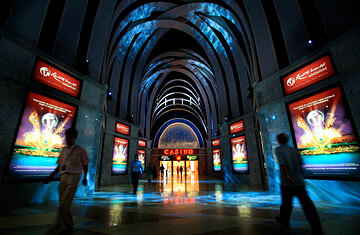 The two Singapore casinos, to be sure, have significant long-term advantages. Unlike the crowded gaming markets of Macau and Las Vegas, they will be operating as a duopoly with no immediate fear of further competition. The gambling tax rates will be significantly lower in Singapore than they are in Macau. And, most important, the casinos sit on perhaps two of the most coveted pieces of real estate in the country, enhancing their appeal to both locals and foreigners. Marina Bay Sands is minutes away from the city's downtown offices on a fringe of sea-facing land overlooking the ship-sprinkled waters of the Singapore Strait. While the resorts may initially struggle to recoup their costs, Singapore, nevertheless, is likely to see the benefit sooner. Casinos will likely help create tens of thousands of new jobs for Singaporeans, as well as entice tourists from across Asia. "The Singapore government sees the casinos as a means to an end," explains Credit Suisse's Chan. "They want visitors to come to Singapore and spend money on entertainment and hotels and shopping, not purely on gambling." Citigroup expects the casinos to help push up visitor arrivals to 12.8 million by the end of 2011, roughly a third higher than where they stand today. Says Noel-Johnson, "The biggest winner will be the Singapore government because of the spillover effect on hotels and tourism." Even as the odds appear daunting for its casinos, like any prudent gambler, Singapore has carefully hedged its bets. Read how one giant casino could turn around Las Vegas.